I haven’t blogged since Tuesday??? Are you sure??? Well, that’s what work does, I guess. It screws up my whole universe–including blogging! So it’s a Saturday post that no one will read, because you all have lives that you live during the weekend. Whereas I am thoroughly enjoying a quiet Saturday night of computer time. 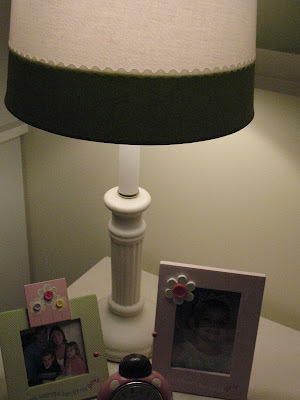 This week another blogger mentioned her love of small accent lighting. If I were a better person, I would scour my bloglines and comments section to find her, but alas, I am simply too lazy. If you’re her, PLEASE let me know so I can link to you! That being said, I started thinking about the lighting issue and how it can warm up a home. I grew up in a home that had some little accent light in just about every room. My mom loved the warmth that a little light can bring, and now I do too. You done good, Mom! By lights, I don’t necessarily mean standard sized table lamps. The smaller the lamp, the better. A tall buffet lamp, a petite nightstand light, a little candle stick lamp, the list could go on and on. This may be a little modern for some, but I’m in love with it. It was $6.00 at Ikea, and I’m bummed I didn’t buy 37 more of them. Another Ikea purchase. My husband said, “But it doesn’t even light anything up! You’ve got it on a bottom shelf!” Amateur. He obviously doesn’t get the look I’m going for. 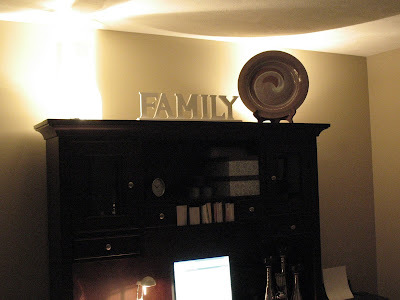 One of my absolute favorite means of establishing a lighting mood is uplighting or underlight cabinets. I tried for hours…well, minutes…to get a good picture of the uplights I have on my desk, but it just doesn’t show the effect. The uplight on the left looks some ethereal being is visiting me, but it’s just a crappy camera–trust me. I even have one in my laundry room, but you’d have to find it through the pile of clothes. What about you? Do you also have a love affair with little lights? Do you get just warm and fuzzy inside when just the right lighting has taken over the room? Well, I do. By all means…share away! And by “share away” I mean find a way to do that, because I am too dumb to know. I guess talk about it in comments? 🙂 We’d love to see your “mood lighting” too! Hi there. I, too, missed your posts during the week. And, I’m a special ed paraprofessional, so I am also counting the days til summer vacation. Only 176 more to go!! Nice to see you here on this date night. You know you get extra blog credit for blogging on a saturday. True story. Enter my giveaway if you get a chance! I’m so glad you survived your week and had enough umph left to blog (and entertain me!). I just found your blog this past week and have enjoyed reading all posts so much. Thank you! Here I am on Sat. night with nothing much to do but read your blog. Your lighting photos are great. A neat idea for a post. Nice! I love me some Ikea stuff. Hope you had a nice week back at school. We missed you this week. I guess I’m having a boring Saturday night too but in my defense, we had Hanna remnants today so we didn’t even think of leaving the house! I enjoy my Saturday night computer time too. I love all of your lamps. We have NO overhead lighting in our living room, so I love lamps. Ohhh..I’ve only been on here 500 times to see if you posted this week (bloglines and all baby) LAME! I love accent lighting. I really dislike overhead lighting. Accent lighting just makes my home feel more cozy and I feel thinner eating ice cream by a dimmer light. I love accent lighting too. After five years of living in this house my husband finally has given up on trying to turn on the overhead light in the family room–I detest overhead lighting!! Okay I’m in love with all your skinny buffet lamps. Love those little babies. I too am a lamp lover. I did some lighting under my kitchen cabinets but am scared to share as you would all laugh. But hey it works. Some of us just don’t have weekend lives… LOL! Love the lights, especially the round one on the bottom shelf. Good morning Chris! I love all your lighting! They look so soft and cozy! Chris, Love your mood light blog yesterday. Thanks for the “mom” compliment. My addition to ideas is:use up lights on the floor behind a palm plant. what a nice shadow effect it makes on the walls. It brings the outside in. Speaking of outside! I adore my out door yard lights. Especially the flood lights that shine onto the house. Yours are fantastic shinning up onto your tall stately home. Share a night picture of your house outside. How beautiful!! Lighting is where it’s at, Bay-Bee!! My fave part of a room, and one of the simplest things to change! Love all your insp. shots…maybe I’ll do a post on mine. maybe. I am so glad you are back…I know work can sometimes get in the way..hee hee! I love the lamps. 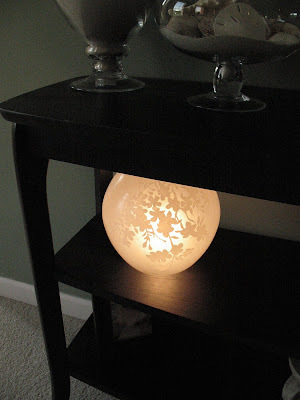 I saw that ball/floral light at Ikea last week…it is cute how you used it! I love the flickering lights…my whole house flickers! LOVE me some mood lighting. I’m so caught up in getting the foundation of our home done, I haven’t really been able to do any accessorizing yet. I CAN’T WAIT to do that part of it. I’m going to go LAMP CRAZY! And no, you don’t have to leave your hubby for Matt Damon…the stories I could tell…hee hee. I have lots of little lamps and mood lighting, my problem is remembering to turn them all on when it gets dark. FAIL! Oh, I LOVE all of your accent lamps. I too love lamps here and there around the house. Great pictures. How fun. I love lamps. With a passion! Hey – I’m hosting a giveaway on my blog! Check it out ! Hey I have been checking for new posts all weekend so I am a loser too. LOL I have that little round IKEA lamp too, I love that. I am so happy you stumbled to my blog, because now I have found yours!! I love this post. We are getting close to unpacking the last box in our house, and I am just beginning to think about decorating (much less lighting). But I completely agree with you–lighting sets the mood! And the piece from Ikea that confuses your husband is just wonderful. Just tell him your blog friends said so! We started back to school on Aug. 18. It is my first year and it is going pretty well. I teach oral communication at the high school. What about you? 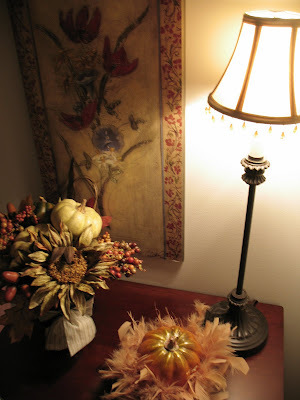 I have a love affair with lighting too, especially in fall and winter. My husband jokes that it’s my job to turn on all of the lights in the morning and his job to turn them off at night. I love lamps like you do! 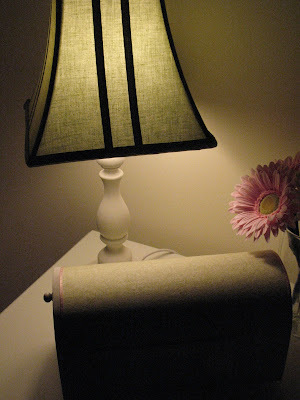 I love turning on a few lamps at night (or during the day) and how it makes the house seem so cozy! I do, I do! I love lights and lamps and I agree! The more the better! 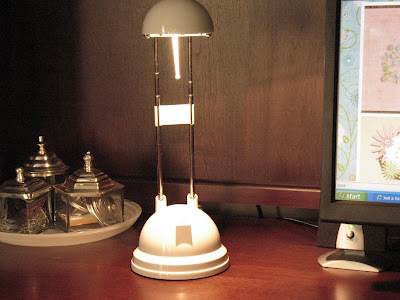 I love all your little lamps… and if I was itching to get to Ikea before this post, I’m REALLY itching to go now! I think we’re soul sisters!! I, too, take pride in having “mood” lighting in each room of my house. I rarely put overhead lights on, and love the look of a great lamp. I have dimmers on almost all of my lights, and I use them! I think you’ve just inspired me to write another post about lighting. Heaven knows I need some post ideas…!! Love your blog, no matter how often you post! Gotta have mood lighting! Loved seeing all your wonderful lamps!!!!!! I love lamps! I like all the wonderful ambiance it creates in a home. You can never have to many cute lamps to light up a area. 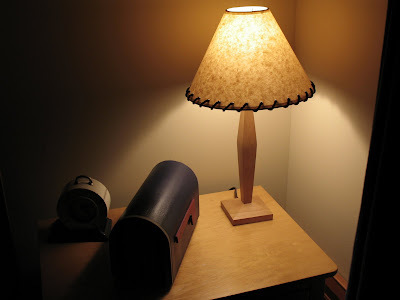 I just posted about one of my new lamp finds. Too funny! I love lights as well but just don’t really use them. We have a horrible lack of shelving/tabletop space in our house. We have a tri-level, 5 bedroom, 2500 square foot house with no flat surfaces for lights! What’s wrong with us?? I’ll have to make a point to go around and look for my lights and see if I have any unique ideas to post about. Thanks for the inspiration. I finally have time to sit down & leave comments on my favorite blogs! 🙂 Glad to see you're still around. I, also, LOVE mood lighting. It's so cozy! You know what I would love to do? 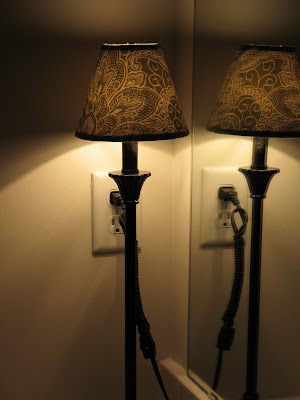 I would love to have one switch that would turn on all the mood lighting in the house at once. You know, like the light-switch that Rock Hudson had in Pillow Talk… lights, music, etc. Now I sound wierd. I just had the most lovely time reading your blog tonite! I'll definitely be back for more ideas & smiles! You know, I keep telling my hubby that we need lamps and not just overhead lights. He says that they make enough light why do we need more. Ugh…he just does not get it! I love your style! Sure sets the mood, I want to curl up and read a book…..